I'm talking about public art and, as a city, we are sitting on a goldmine of seriously good work by some of the country's (and the world's) best artists. No matter what time of day (and without an admission fee), you can access a treasure trove of aesthetic riches. 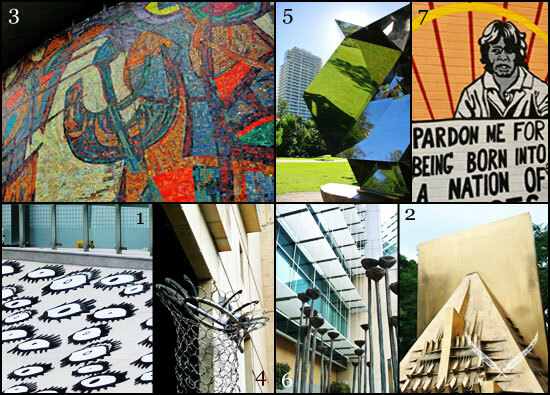 While there are wonderful pieces all over our city, I've compiled a very CBD-centric list to get you in the mood to start hunting down Brisbane's best public art. This stunning new work by Japanese artist, Yayoi Kusama, will soon be unveiled as part of the new Supreme Court building on George Street. Getting a photo of this sprawling piece was tricky: miles of temporary fencing and countless workmen in high-vis vests cover the site. Luckily, an obliging security guard let me stick my camera lens through the fence, but was baffled about my eagerness to photograph Kusama's work. While she is one of the world's greatest living artists, there has been a bit of controversy over the cost of this artwork. My friendly security guard asked me if I thought it was worth the one million dollar price tag, to which I gave him a resounding YES. These stunning bronze works by Italian sculptor, Arnaldo Pomodoro, are a remnant from Expo 88, where they took centre stage at the event's main entrance. After being purchased by the council, they've since come to rest on Upper Edward Street, shining like beacons at the top of town. Based on Greek Mythology, I reckon they've also got more than a hint of the sci-fi about them. This large-scale modernist mural was produced in 1959 when Victorian artist, Lindsay Edward, won a competition to create a public mural for the State Library Building at its original William Street location. The State Library is now on the other side of the river, but the colourful glass mural continues to brighten up William Street with its 1950s retro feel. Walk a bit further up William Street and you'll find this beguiling work by Brisbane artist, Barbara Heath. Best known for her exquisite jewellery designs that have a distinct architectural quality, this large-scale sculptural work almost looks like a piece of jewellery that has been taken to a new level. Another throwback to Expo '88, this large sculpture is a lesson in geometric style by American artist, Jon Barlow Hudson. With its highly reflective surfaces and illusions of form, it sits beautifully in the Botanic Gardens. I was sad to see more than a sprinkling of graffiti on its shiny surfaces when I was out photographing the works for this story. Let's show our public artworks a little more love! Queensland artist, Fiona Foley, tackles hidden histories in her work. This sculptural piece focuses on the tragic and violent conflicts between White Australian settlers and indigenous populations in Queensland. Originally featuring water elements, the work has been dry for the past few years, but still retains its stoic beauty. Foley reminds us that the land we walk on has a tumultuous and troublesome history. Hidden down Burnett Lane is this three-panel mural by influential political artists, Richard Bell and Emory Douglas. Bell's in-your-face work is notorious for drawing attention to Indigenous rights in Australia, while American Douglas pursues similar issues in his work in relation to African-American rights and the Black Power movement in the U.S. This is street art at its best, right in the heart of the city. Nadia Buick, a PHD fashion candidate at QUT, knows a thing or two when it comes to art and style. Working as a freelance fashion curator, she is an avid wearer of vintage (just ask for her best spots about town), collects old paintings and postcards and can always find the beauty in a little clutter.